I have heard people don’t grease the lip any more. What year bike is it ok to do this? My 2014 yz450 I’ve had dirt come around the lip and stop at the grease so I always grease it. What do you guys think it would be nice not to. It makes such a mess. I have a 09 kx 450 and 250. No grease on those. No toil is so tacky it basically glues the filter to the airbox. my 17 yz450f is fine with no lip grease. I use no toil red spray and spray both sides of the filter and work it in by hand. I also put and extra coat on the lip of the filter. If its not dusty or Im not riding sand I can get a few track days out of a filter with no signs of dirt getting by. I think that grease idea was from many years ago when filter/cage design was different. In my opinion, there is no reason to do it. The cage clamps the filter to the airbox right? The absolute last place air will leak is there. Are any of you old enough to remember when a magazine said to grease the inside of the entire air box? LOL What a mess that was! I don't use grease on my 18 250 SX either. Never had any problems with all my other bikes and all I rode was deep sand tracks. Hmm good to know guys thanks. I have always done it. I use Maxima FFT oil non spray so I know the oil is good. I need to pull the airboxes off my bikes I guess and get them super clean and then no more grease. It makes such a mess. I always try to wipe it up but you just cant get it all. I also have an 03 yz125, im guessing that is new enough its fine too. Landis, what filter are you using? Realistically you shouldn't need any grease around the lip. I use FFT and never had an issue on my 14 450 when I had it. I have an assortment of them came with the bike from my buddy. It’s real nice until I have until I have like 10 filters piled up that need washed. I’ll give the no grease a shot. Honestly fft is almost grease. I put a little grease on the lip of my FC450 like the manual suggests. Cheap insurance is how I see it. An engine going KERBLAMMMO will really "make such a mess". Grease it up. Yeah this is what my thought has always been. I think I’ll keep doing it. I use No Toil filter oil and grease. It’s biodegradable and can be cleaned up with their cleaner. Definitely a peace of mind thing. No issues so far with my 13 YZ250 or 16 KX450F. Yea I grease as well with No Toil grease it's a few extra minutes verses and blown up engine, the less dirt that goes thru the engine the longer the life. Trying not to get off topic but do you guys who use notoil change your filter every ride/wash? I just came back to notoil after about 5 yrs of FFT and seem to remember that notoil felt like it “dried out” after a week or so of sitting in the bike. This was the green type but now I’m using the red and it comes out like honey almost and seems a little stickier now. Also I don’t use grease around the filter on my yz250. I use the red spray type. I opened my air box after 6 months of sitting over winter to clean the filter from last time i rode. I quickly remember why i use gloves with no toil. It doesnt get dry. Tacky as hell all the time. I haven’t noticed the green No Toil drying out on me, but I typically change the filter every 2-3 hours. the one thing i've noticed with notoil is the oil migrates to the bottom of the filter more then other oils in my experience. I run the dt1 double foam filters with the rubber lip don’t need to grease them but I do out of habit..
Make sure your filters are in good condition and replace them often. I use no toil red spray. I have had good luck. It comes out of the can very light red so sometimes it can be hard to tell if your getting a good amount on the filter. I usually do 3-4 light coats on the outside and a few light coats on the inside. I then work the oil in by hand. I run DT1 filters most the time but I will still put a coat on the lip of the air filter. Helps keep it sticky to the housing. I could see how it could be easy to not apply enough. I always let it dry over night before putting it on the bike. Ill usually oil a few at a time and then lease them sealed in a bag. My bike just sat for 5 months over the winter and the filter was still sticky to the touch. 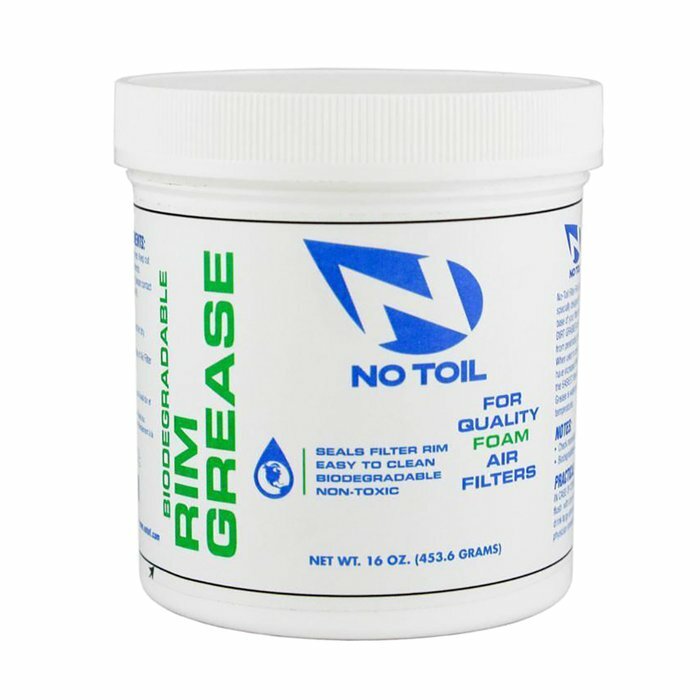 Haven’t used grease in 20 years, air boxes are always spotless, PJ1 or Bel-Ray filter oils.